I read. A lot. I go through so many bookmarks it seems crazy. A lot of times I have to end up finding a slip of paper that’s lying around to stick in my book because for some reason, I just can’t seem to keep bookmarks. Could it be because of my 2 1/2 year old? Probably. He likes to just pull out my bookmarks and then he runs off with them. 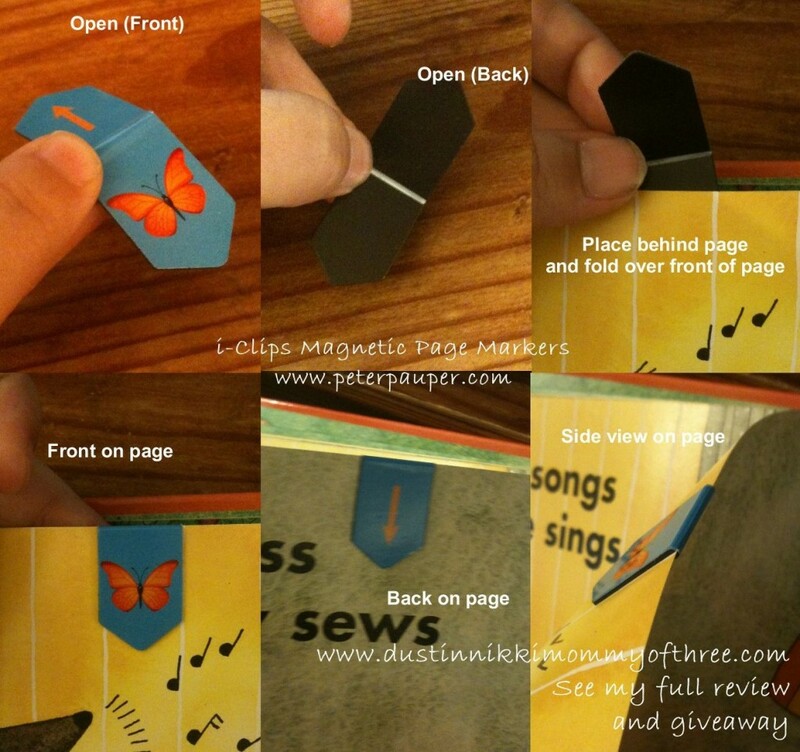 The last product that I received from Peter Pauper Press for review was a pack of i-Clips Magnetic Page Markers. I couldn’t wait to try them out! I received a set of Butterflies i-Clips and I love them! There are 8 clips in a pack in 4 different colors (2 of each). I love the colors – blue, green, orange, and pink. Of course I love butterflies too so that’s a bonus! Of course there are many different sets to choose from including characters for kids such as Spongebob! They are really easy to use and I love that when they are opened up, there is a crease in the middle to prevent any kind of breakage in the magnet. That way you can easy open them completely to easy mark you page. They aren’t something you have to fight with to slide on. After you open one up, you place the back part behind your page and flip the front downward. It’s really nice because there is even an arrow on the back showing you the correct way to use them. The two sides are then magnetized together marking your spot in your book. I love how I don’t have anything actually sticking out of my books now. My son can’t just come up and pull it out. They remind me of something like tabs except they aren’t tabs that stick out and you can clearly see your place when your book is closed. The other great thing is that they STAY PUT! They can be easily removed when you pull them off but only when you actually pull them off the page. They are absolutely great! Another way that I like using them is by keeping my place in a folder or stack of papers. Even using them as something like clips if I need to keep a few pieces of paper together. The colored markers help keep me organized too if I am using them that way. So they don’t only make awesome bookmarks, they are a really great organization tool too! They are made really well, I love the design and their functionality and would definitely recommend them to anyone! I also use them on the refrigerator! 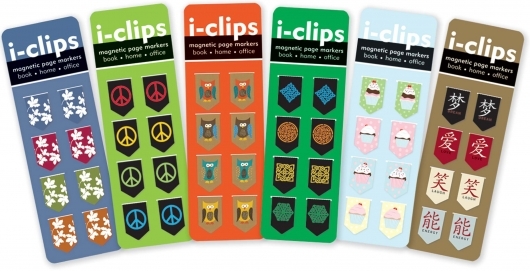 Buy It: Visit Peter Pauper Press to purchase your favorite i-Clips for $3.95. They make great gifts too! Win It! 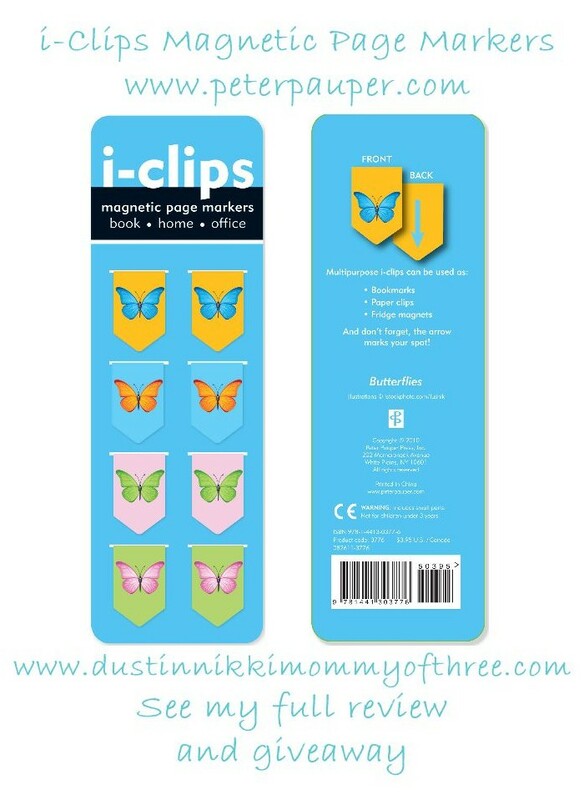 Thanks to the company, one of my lucky DustinNikki Mommy of Three readers will win an 8 pack of i-Clips Magnetic Page Markers for themselves! I love THE ULTIMATE LIFE ORGANIZER. I need that. I love the Skulls and Crossbones iPad cover! I love the ASIAN MONOCHROME JOURNAL.